Delphi IDE Colorizer – Want to run Delphi Seattle with a Dark or Light theme? This is the IDE plugin for you. Parnassus Navigator – Adds an excellent minimap scroll bar to the right side of the Delphi Seattle IDE code editor. Also includes a quick goto method navigation window. Delphi IDE Theme Editor – Customize the syntax highlighting and color of the code editor in Delphi Seattle. Parnassus Bookmarks – Add bookmarks throughout your code and then quickly navigate back to your bookmarks in the Delphi Seattle IDE code editor. FixInsight for Delphi – Static code analysis plugin for the Delphi Seattle IDE which can help you locate potential bugs before they happen. Delphi Preview Handler – Preview Object Pascal files with syntax highlighting in the Windows Shell without opening a code editor. Delphi Dev Shell Tools – This is a Windows Shell extension utility which gives you all kinds of useful operations you can apply when right clicking on Delphi files in Windows. EurekaLog – Exception tracer tool which can trap and trace exceptions and memory leaks at runtime. Have your app automatically report the problems to you via email or the web. Pascal Analyzer – Object Pascal reporting tool to help you measure, check, and document your source code. Helps you achieve easier maintenance, fewer errors, improved code quality, and easier migration of projects between programmers. IDE Install – Easily package up your components for distribution with this simple to use Delphi IDE installer tool. 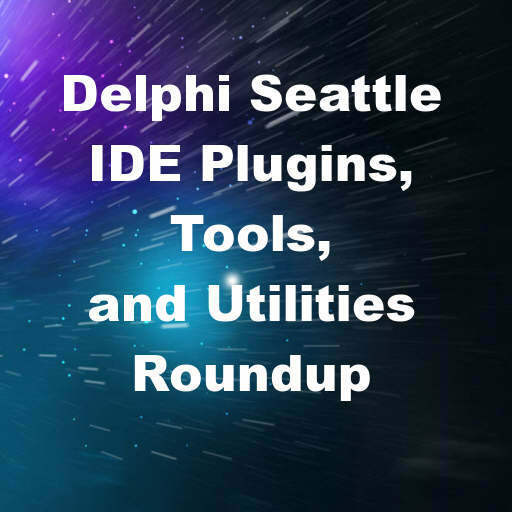 Are we missing your favorite Delphi tool that supports Delphi 10 Seattle? Post a link in the comments!